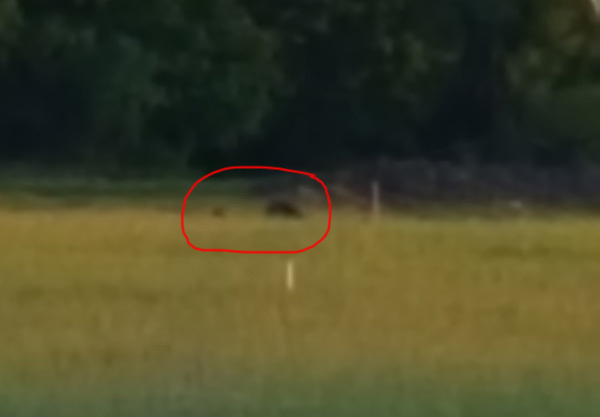 Tag Archive | "bear cub"
A bear and her cub were sighted in a field at the end of West Street last month. The Post was alerted this week that there was a possible bear sighting early last month at the end of West Street. According to Sally Hoornstra, she saw what she thinks was a mama bear and her cub in a field behind where the Wolverine Skyhawks fly their remote-control airplanes. It was on June 4, at about 8:57 p.m.
“It sure looked like a bear to me,” she said, and noted that she wasn’t going to get any closer. Hoornstra said that was the first time she had seen it, and has not seen it since. She did not report it to the DNR but said she would in the future if she sees another bear. The sighting was passed on to Victor Hansen, the owner of Display Pack, (which is near the site) last weekend, who passed it on to the Kent County Sheriff Department. The City then passed it on to the Post, to make people aware that there could be bears in the area. Kalejs said that if you see a bear, back away slowly, stand tall, look large, and make noise. “Black bears are shy, and will usually head in the other direction,” he said. He also noted that if you have bears near your home, try to get rid of food sources such as bird feeders and grills. For more tips on what to do if you see a bear, watch this video at www.youtube.com/watch?v=AB5AS6BRuY8.